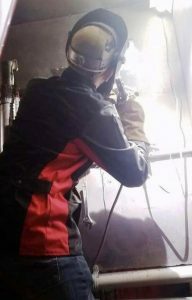 Ralph, 23, from Houston, Texas, graduated from the Welding Specialist program at Tulsa Welding School & Technology Center in Houston in May 2017. Thanks for your time, Ralph. Tell us what you did before you came to Tulsa Welding School. I did 2½ years at a local community college, but it wasn’t for me. I was going to be this fancy engineer, but then I realized that you had to be a better student than I was. I just wasn’t mature enough at the time to do all that stuff. I realized it wasn’t for me. Then I just worked to get by for another two years. I found out my sister was working for Tulsa Welding School, so this opportunity kind of fell into my lap. I didn’t really know what I wanted to do, but I knew that I needed a career. I was about to get married. I knew I had to be able to take care of my new wife. I enrolled in July 2016, and then she and I got married in December 2016. She’s studying mechanical engineering at the University of Houston. I actually attended Tulsa with my dad. WE graduated together. That’s cool. What prompted you and your dad to enroll together? My dad was having a hard time trying to find work after getting laid off, so when he figured out I was interested in going, we talked about it and thought, why not. We thought we’d just dive in and get ourselves a trade. I had an idea about welding, but it was pretty new to me. My father actually tried to push me to be a welder right out of high school. He’d done commercial and industrial work before. He thought picking up a trade would be in my best interest. But I just wasn’t interested in growing up at the time. Not to say that my favorite part was being in the classroom and learning all the details, but I did find that a little exciting. I liked learning how everything works and being able to put it together with my hands. Seeing it come together right then and there was awesome. The instructors were awesome, too, though. Tell us about your job search. After graduation, I took a couple of months off to take care of some stuff. Then I took weld tests at different places, but to no avail. I was making too many nervous mistakes on the tests. I’d been trying to find work on my own, but when I got back into contact with Donnie Whiters [Houston Career Services], he set me up with the Southwest Shipyard job in Channelview, Texas. I took the weld test and passed, and that’s where I’m working at now. It’s my first job as a welder, and I like it a lot. Why didn’t you use the Career Services team when you first graduated? I guess I wasn’t thinking that clearly. It was maybe a pride thing for me. I don’t like to ask for help. I was just very confident after graduation that I didn’t really need much else from the school, that I was perfectly capable of getting my own stuff together. I plugged my name into all the job search engines but got nowhere. But Tulsa followed back up with me, and Donnie got me the job. Why did you struggle with those weld tests? When I failed a test, I’d get more nervous about failing the next one, so I got really discouraged. I think the test for Southwest Shipyard was maybe the fifth or sixth test I’d taken. Did you go back to Tulsa to practice between the tests? I’d go in to school to practice, but I didn’t want to waste my instructors’ time by asking for help. I figured that they would think that because I’d graduated, I knew what I was doing. So what changed? How did you get your confidence back? This last time around, I had old instructors, like Jeff, come up and give me some pointers. I even had Albert come into the booth with me when he saw me struggling. It made the world of difference in passing the test. I was confident going into this one because I knew that the guys at Tulsa had my back. I really utilized Tulsa to the most advantage they would give me before the last test. I do structural welding on barges and maintenance on boats in dry dock. It’s interesting, I’m doing something different every day. I’ve even been welding on stainless steel. 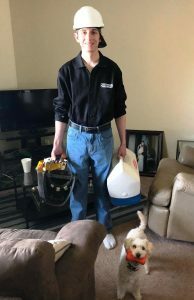 What was it like getting your first welding paycheck? It was very exciting. My wife was very proud and happy for me. Of course, I immediately wanted to call Donnie and let him know how thankful I was. I really want to stay where I am for about a year, learn as much as I can about this field and then move on. Hopefully I can work in a shop, or maybe I could find a refinery job or work at a plant like my dad. There are plenty of those jobs, especially here in Houston. I’d like to keep grinding on for a few years, and then make the bigger bucks. Maybe when I’m older and ready to retire, I could become an instructor and enjoy that time. That would be a good retirement for me. I really enjoy thinking about where this career can take me. I’m just learning how to become a more thorough, aesthetically pleasing welder. I’m making things look pretty now! But I really like thinking about where I can go with this, like working on new ships at a shipyard, or becoming a pipewelder somewhere. I like the idea that this job can take you anywhere, as long as you’re willing to put in the effort and take advantage of the opportunities before you. Keep thinking about your future. Picture what you want it to look like and where you want to be. That’s your motivation right there. Focus on that every day. Don’t be afraid to ask questions, and make use of the school’s resources. They are all very thorough with their jobs. When they say they are going to help you, they mean it.